Any Doctor Who fan knows that the show features some pretty strong personalities. 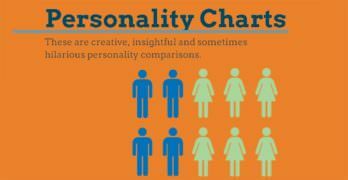 What you might not realize is that most correspond perfectly to the MBTI personality types. 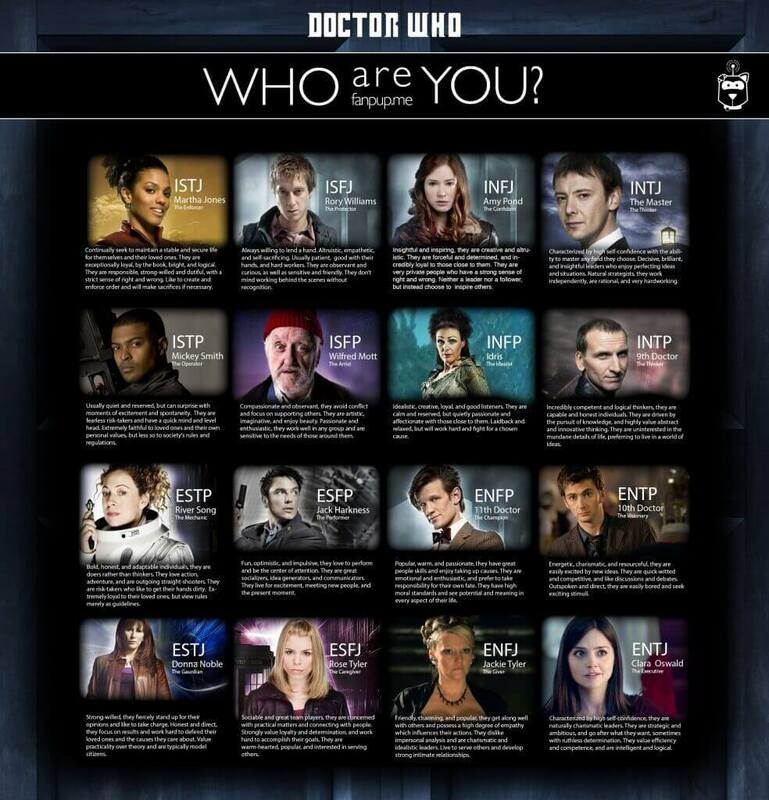 Which means that you can figure out which MBTI group you fit in by combining psychology and a love of Doctor Who. There’s two ways to use the chart. If you know your MBTI, you can just check for your match on the chart. 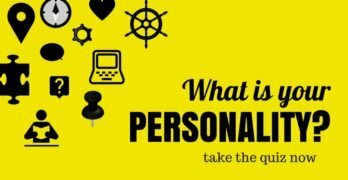 If you don’t know your MBTI, you can have some fun figuring it out. The best way to start is by looking at all of the characters. Think back to some of the stories they’ve been in, and how it affected you. For example, when Rory was acting as a centurion to guard Amy, did that resonate with your own life? A lot of people feel like their main goal in life is to protect people. Like Rory, they’re defined by a self-sacrificing nature. It would mean that like him, you are an ISFJ on the MBTI scale. It should be noted as well that the chart is all about the personality you have, not how you’re using it. We all have traits that can be used to help or to hurt. Take The Master, for example. He’s an INTJ, and as such has some very laudable qualities. He’s able to master almost anything he puts his mind to, he can be an insightful leader, and he’s hardworking. Through most of the show we see him putting these traits to not so kind uses. But it’s important to remember that he lived an entire lifetime as Yanu, where those traits helped to save the human race from extinction. It’s also important to remember that personality types don’t dictate one’s fate. For example, consider the case of Rose and Jackie Tyler. Rose used her caring nature as an ESFJ to propel her into caring for the world, by caring for the Doctor. In the end she became one of the greatest heroes of the series. Where her mother is an ENFJ, and kept her role as The Giver on a far more localized level. Instead of focusing on the world, she simply ensured that Rose always had a home to come back to. But of course one can wonder if Rose would have ever fulfilled her potential as The Caregiver if she hadn’t had the support of The Giver. I just took the MBTI test and guess what, I’m an INTJ. Before taking the test, I carefully read about the personalities of all the doctors in the series, Doctor Who. In the end, I found myself to be very close to “The Master.” I’m a rationalist from top to bottom, loves to work independently, work very hard for my things and so on. But I also agree that in spite of having many of these qualities, I haven’t been able to make the best use of them to my advantage. Was really shocked to find that I got an INTJ after selecting The Master with whom I could really relate to, as far as my personality and nature is concerned. Brilliant stuff!